Several dignitaries paid glowing tributes to the country’s first woman prime minister Indira Gandhi on Sunday on the occasion of her birth centenary. 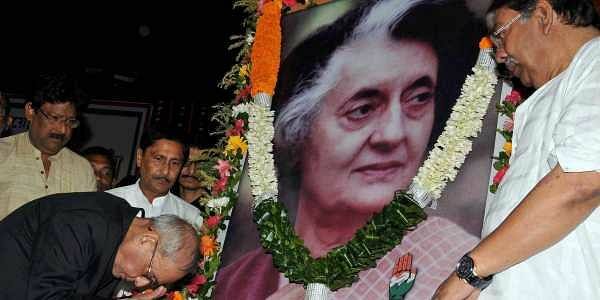 NEW DELHI: Several dignitaries paid glowing tributes to the country’s first woman prime minister Indira Gandhi on Sunday on the occasion of her birth centenary, with President Ram Nath Kovind, Prime Minister Narendra Modi, Congress president Sonia Gandhi and former President Pranab Mukherjee leading the remembrance. Terming Indira as “one of the greatest” prime ministers, Sonia said there was only one religion for her -- that all Indians were equal children of the motherland. The President and the PM tweeted to pay homage to Indira. Former Prime Minister Manmohan Singh, Congress Vice-president Rahul Gandhi and his cousin, BJP MP Varun Gandhi, also remembered her. Pranab, Manmohan and Rahul paid floral tributes to the former PM early in the morning at her memorial ‘Shakti Sthal’. “I remember you Dadi with so much love and happiness. You are my mentor and guide. You give me strength. #Indira100,” Rahul later tweeted. Varun’s tweet read, “Courage is the most important of all the virtues because without courage, you can’t practice any other virtue consistently. To a lady that was a mother to this nation. Miss you Dadi... I know you always watch over us.” He also posted a picture in which Indira is seen holding a toddler Varun in her lap. Tributes were also paid in Parliament’s Central Hall, where Lok Sabha Speaker Sumitra Mahajan, BJP veteran L K Advani, Leader of Opposition in the Rajya Sabha Ghulam Nabi Azad, senior Congress leader Mallikarjun Kharge and MoS Parliamentary Affairs Vijay Goel were in attendance. The Congress president said Indira fought for secularism and against all those forces seeking to divide the people on the lines of religion and caste. “For her, as the prime minister, there was one religion, a sacred creed passionately held -- that all Indians were equal children of the motherland,” Sonia said at a photo exhibition organised in the memory of the late leader at 1, Safdarjung Road. Pranab remembered the former PM as a leader of “courage and conviction”. “In her death, she left a message to the people of this country and to the whole world: a commitment to the people can never be killed by any power, however strong it may be,” he said.